On the agenda for today was not only getting out of town, but getting out of France and into Switzerland. Expecting it to be more arduous than border changes in the United States, we prepared for the worst. 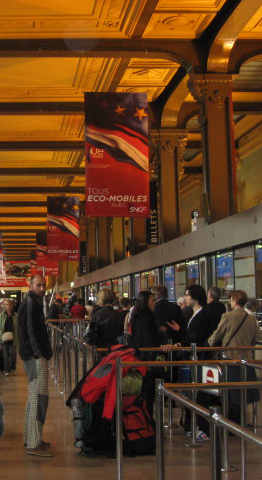 The crowded Gare de Lyon with passengers queued up at the ticket counters awaiting their turns. The actual train ride to Geneva was long but quite pleasant, and though we had first class seats, we found ourselves content to stay where we landed in a second class car. Moving the bags through the train just seemed like altogether too much bother. 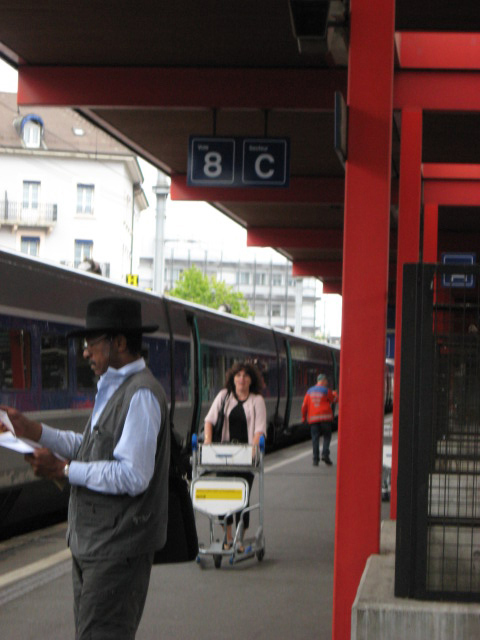 The comparatively empty Gare de Genéve upon our arrival. Surprisingly, we walked on and off the train, through immigration and out of the station with nary a glance at any of our papers: not our tickets, our ID or our passports. It must have been that huge sign on our foreheads that read "Innocents Abroad" that tipped them off to the lack of threat. We gathered our wits once we were out of the station, and found a bank that would dispense Swiss francs, since we learned that the euros we had gone to the trouble to procure were not exactly the most welcome legal tender in Geneva. The ATM spat out 100 franc notes, so I had the opportunity to go into the bank itself and ask for change. At least I got out of the rain for a moment or two, and nobody attempted to speak to me in English. We found ourselves a taxi who would take us to the Institut Oecumenical where we would be staying, situated outside of Geneva by about eleven miles. We would be making the trip into Geneva by train, bus, and foot for the next couple of days, but the baggage made a big difference in this instance. While we were loading the suitcases into the back of the car, I missed seeing one of them, and mumbled to myself in French "Oh! I am blind!" as I realized what I had done. The driver overheard me and replied wryly "Hereusement, madame, vous n'êtes pas. (Happily, madame, you are not.)" True enough, thank goodness. 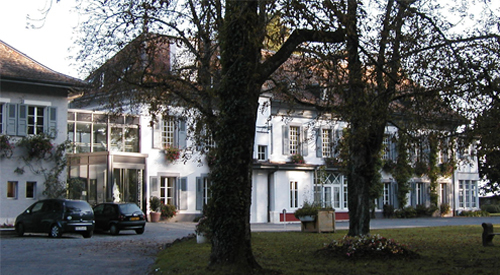 She dropped us off at Château Bossey, a beautiful facility set in the Swiss countryside. 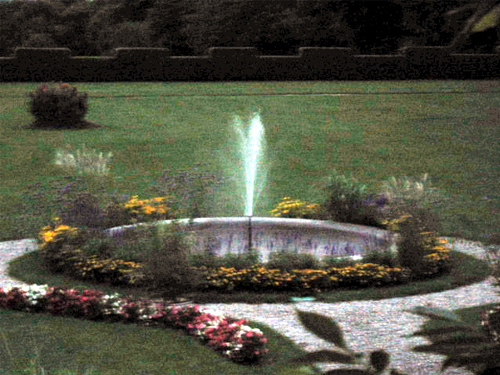 It is surrounded in the front by forest and a bit of farmland, and in the back by well kept gardens, including this one with a fountain at its center. The view from our room would have looked different if we had arrived a day later and not had a choice; as it was, we were given a choice between second floor and third floor accommodations. 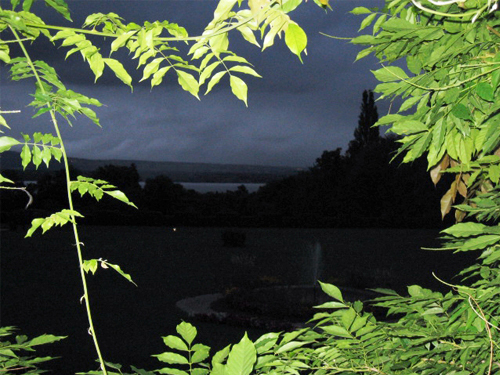 Had we taken the third floor, the windows would not have had this vista of Lake Geneva.